on Thursday, September 27th, 2018 at Gilligan’s. Evertz presented a program and discussion about how IP is dominating current broadcast system designs in Radio, TV and all other forms of media and the Evertz vision of what the future holds for us in broadcast with that type of technology. 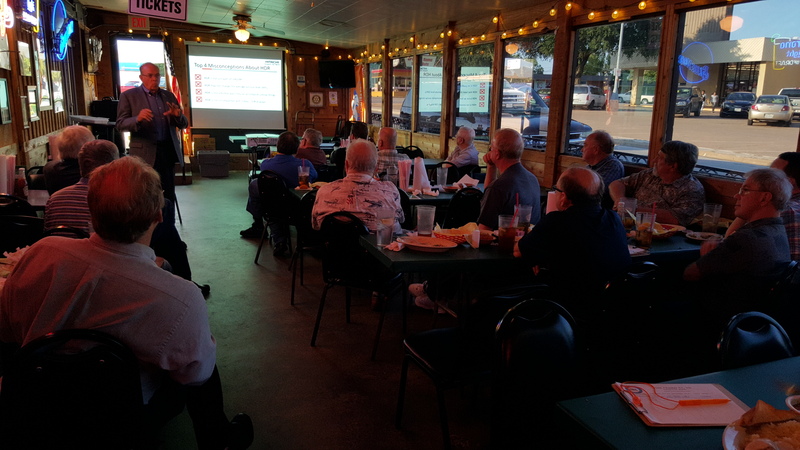 The August Chapter 67 Monthly meeting was held on Thursday, August 30th, 2018 at Gilligan’s. for a much better understanding of why 5G and Massive MIMO technology is so different and important. This was Bob Orban presenting via GoToMeeting.com presented by Broadcast Supply Worldwide and this time the presentation covered Orban’s approach to automatic, CALM-Act-compliant loudness control as embodied in the Optimod-TV 8685 Surround Loudness Controller. taking genre into account can reduce some of the practical objections that have been raised as a result of experience with normalizing all program material to the same BS.1770 target loudness. Bob presented measurements showing the effectiveness of Orban’s approach. For those who attended and wanted the ATSC 3.0 coverage slides, they are available, along with much more information, at the GatesAir website, under the Media Center tab with Presentations, Whitepapers and lots of good information including including Steve’s Whitepaper covering the presentation and slides. Our sincere thanks to Sim Kolliner and the CBS 11 Crew for providing an outstanding venue. Lunch was served at Noon and the Meeting started around 12:30pm and ran until almost 4pm when everyone ran out of questions to answer! Sinclair and ATC are partnered to launch the first production NextGen Single Frequency Network <sfn) system=”” in=”” dallas=”” this=”” summer.<br=””> Fred Baumgartner is Sinclair’s project lead, and delivered on his offer to “tell us everything he thinks he knows” about ATSC 3.0, how it might change the way we broadcast, what’s going on in Dallas and what they have learned so far in previous and ongoing ATSC 3.0 Tests. Fred’s initial focus was more on the business, regulations, potential and adoption of NextGen broadcast. As he says “it’s a little more complicated than an SBE program on a particular technology or product. Insoft LLC is the creator of HDV-MIXER. So BSW Director of Business Development John Lynch, and Insoft LLC President (and broadcast engineer) Alex Bonello demonstrated and discussed all of the technical advancements that have made HDV-MIXER feasible, and affordable. This is Visual Radio and it also has turned into being a popular social media addition for Television stations. Mr. Bonello pointed out “You’re not changing your work flow in a radio station. You’re simply adding the video component to your studio shows and your remotes to further engage with and expand your audience”. And click here for Remote use. Note the Case Study on this page from the remote broadcast in Madison IN, July 2017. Also, checkout this Facebook feed from last September shows the interaction of Facebook messages on a remote broadcast. Cue to the 9 minute mark and see Facebook messages on screen and a self-generated news “crawl” which can also be an RSS feed from various news services. Another highlight of the evening was a live SKYPE interview, via HDV-MIXER, with Orban Vice President and well known engineer, Mike Pappas. Mike detailed the new Television product from Orban and took questions live from the members. •The Rules – The FAA has been changing the rules of compliance for tower lighting. Some of the little known changes were discussed. •LED Lighting Technology – LEDs have been around for many years, however they are making a big change in the tower lighting world. 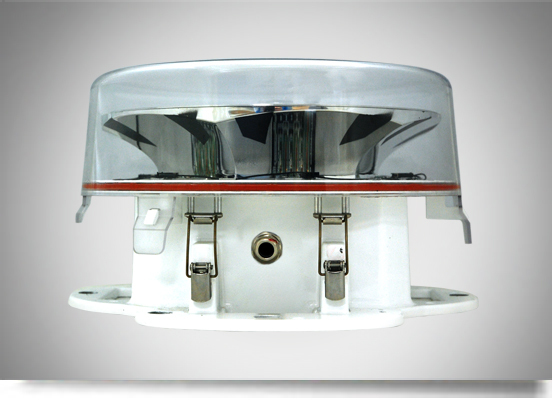 •Tower Lighting as a Service – The traditional way of delivering tower lighting is also changing. Kevin Bethke is the founding COO of LumenServe, Inc. with over 25 years of sales, marketing, and operations leadership in both start-ups and large companies. Mr. Bethke’s experience includes COO of a Wide Area Network and VoIP infrastructure company. Mr. Bethke also served as the CEO of a video content creation and distribution Software as a Service (SaaS) targeted at education organizations and corporations. He has also served as CEO for a talent supply management SaaS provider. While at the above companies, Mr. Bethke lead each to achieve the top ranking for customer service for their respective industry. Mr. Bethke received his MBA from Northern Illinois University and a Bachelor of Science from Southern Illinois University. 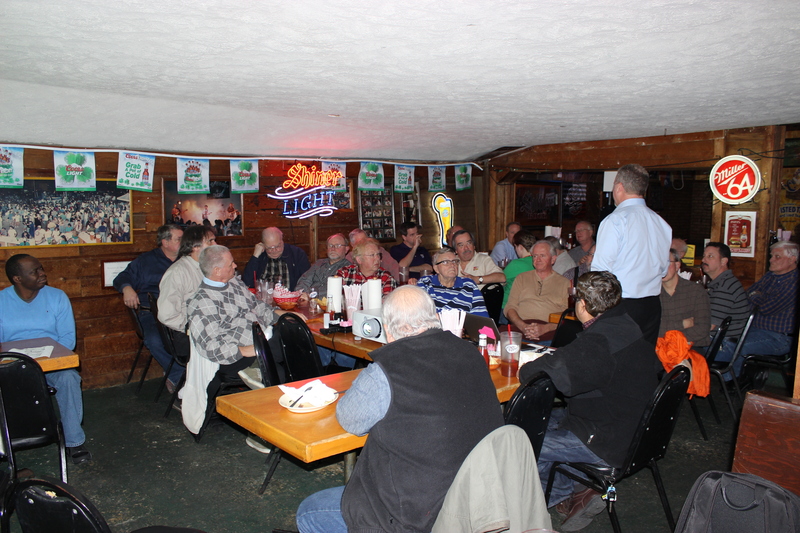 The February Chapter 67 meeting was on the 22nd at Gilligan’s in Arlington. 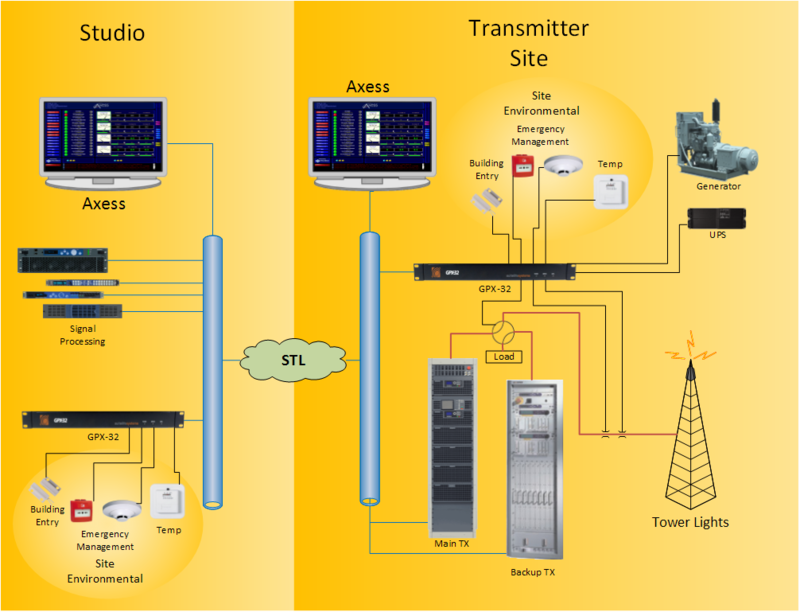 IP based transmitter remote control is providing busy broadcast engineers with much needed relief in the form of better data, more granular alarm notifications and armchair access to multiple transmitter sites. Environmental monitoring and flowchart based automatic control functions increase up-time and protect equipment from extremes, while distributed I/O provides cost savings by eliminating long multi-conductor wiring runs. Editing of last Month’s meeting with Fred Baumgartner at CBS 11 is ongoing. Buddy Brown and the group at KTVT are working on it and we’ll announce as soon as it’s available. “Simply put, the purpose of the conference is to assess how changes to the media industry affect our members and future members and determine ways the SBE needs to adapt to meet the needs of members today and in the future. 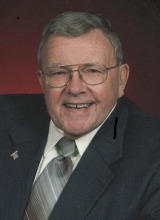 Our friend and Chapter Program Chairman, Jerry D. Ernest, age 81, died peacefully on February 7, 2018. He was born in Dover, Ohio to George Merritt and Ruth Arlene (Dell) on April 26, 1936. Jerry was a loving husband, father, “Pa” and long-time respected friend to many of us who knew and worked with him and his happy spirit will be greatly missed. Jerry most recently tirelessly worked as a Program Chairman and member of Chapter 67 for many years, working to obtain speakers and arrange programs for all of our meetings. Plymouth Park United Methodist Church, 1615 Airport Freeway Irving, TX 75062 saw a large group attend the memorial service at 3:30 P.M. on Saturday, February 10, 2018 to celebrate Jerry’s life of many contributions to his family, church and friends. An Inurnment at Dallas Fort Worth National Cemetery with full military honors was scheduled for Friday, February 16th. For details, Contact Dave Davis – Certification Chairman, Phone Number (817) 235-4300 for Certification information and check the links posted on the Certification Tab above. With current and Re Pack Channels assignments, Frequency, Owner, sub-channels, Power, Tower heights, etc. This presentation was focused on the DFW area specifically and covered the outcome of the FCC Spectrum Auctions and where we go from here. Max also covered some best practices to achieve solid RF performance in difficult environments. 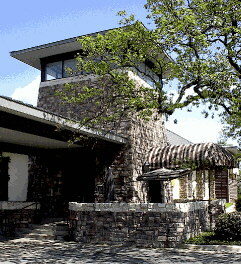 400 E. Abrams St. Arlington, TX 76010. We all enjoyed dinner at 6pm and the meeting at 7pm. Max Francis joined Lectrosonics after a ten-year career in the professional audio and film industries, working as a musician, engineer and technical equipment consultant as well as in acquisitions. In the film industry, Max served as an ADR engineer for international releases such as “Terminator 4” and “Crash” (season one). As a music engineer he has worked with a number of musicians including James Newton, as well as on projects for several artists with the Brooklyn Academy record label. Lectrosonics is a U.S. company located in Rio, New Mexico with a continued focus on quality and innovation since 1971, Lectrosonics is well respected within the film, broadcast, music, and theater technical communities and has a strong history of delivering quality wireless technology with excellent customer support and service. Lectrosonics wireless microphone systems and audio processing products are used daily in mission-critical applications by audio engineers familiar with the company’s dedication to quality, customer service, and innovation. The company provides consulting to customers as part of its customer service for product sales and will also assist you with sound system component selection and design. 416 E Main Street, in Kilgore on Saturday, September 23rd. Our thanks to Chuck Conrad and crew for their hospitality. It was great to see members Hank Hardisty and Curtis Kirk from the Tyler area and Don Dobbs from Tulsa join the group. Everyone had a great time. The group gathered around noon and roamed the Museum for several hours. They’re open until 5pm so you can take your time and enjoy. Some pictures from the visit will be posted here soon. It’s well worth the trip, so if you missed this visit, plan one of your own soon. Click on the Logo to check out their website then click around there to see the amazing amount of Radio and TV history is represented at the Museum. 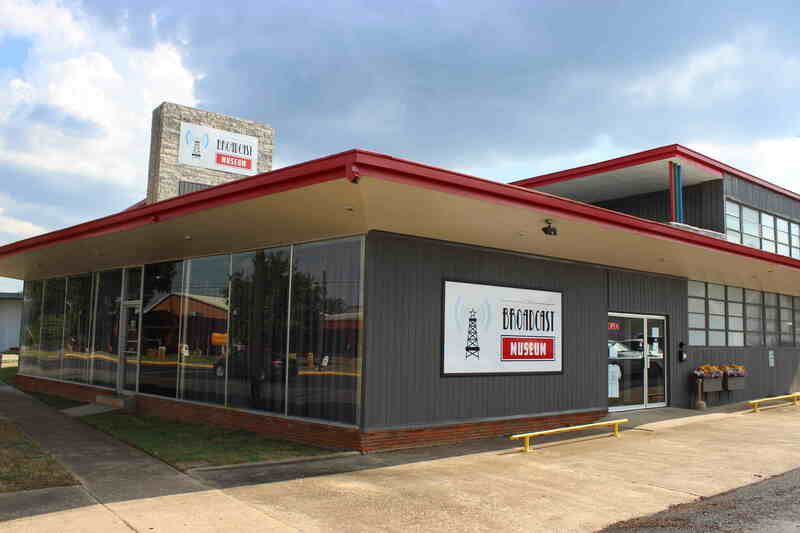 Just jump in the car, head east on I-20, turn right at 135 or 42 and look for this building. Remember, they’re open Fridays and Saturdays 10am to 5pm so you can take your time and enjoy. 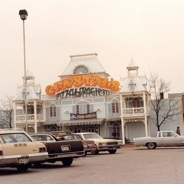 In 1970, Bob founded Orban Associates, to manufacturer studio equipment. In 1975, Orban Associates introduced the original Optimod-FM 8000, which was the first in a long line of broadcast audio processors for AM, FM, TV and digital broadcasting. 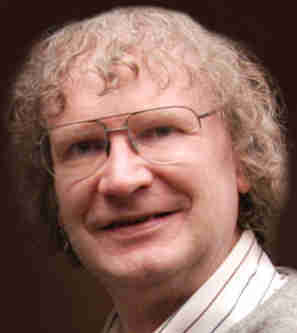 Bob has been involved in Broadcasting, recording and scientific work related to audio. Hope you joined us for dinner at 6pm and the meeting at 7pm. Next Meeting, bring a friend or colleague and learn.Our meetings are FREE, casual and open to anyone interested in a better future in Radio, TV, Audio/Video Production, IT and all the related fields. SBE Membership is not required (but you’ll probably want to join eventually) – and we all get together on the last Thursday of each month. Wayne brings well over 30 years of hands-on experience with 20 years as Engineering Manager/Technology Director at Belo’s WFAA-TV and Member of the NAB Engineering Technology Committee, to the ABIP. His participation in the Inspection Program includes some interesting experiences and tips for avoiding common errors he’s discovered at Radio and TV stations across the state. 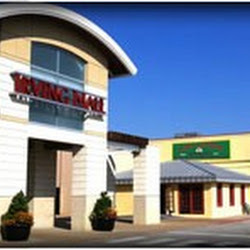 We met at J. Gilligan’s Bar & Grill, 400 E. Abrams St. Arlington, TX 76010 for dinner at 6pm and the meeting at 7pm. Always bring a friend or colleague each month and learn. Our meetings are FREE, casual and open to anyone interested in a better future in Radio, TV, Audio/Video Production, IT and all the related fields. SBE Membership is not required (but you’ll probably want to join eventually) – and we all get together on the last Thursday of each month. We met at Gilligan’s Bar & Grill 400 E. Abrams St. Arlington, TX 76010 Hitachi provided Dinner at 6pm and the presentation at 7pm. While HDR is most commonly promoted with UHD/4K workflow and cameras, a growing number of organizations, including the EBU and Ericsson, are now advocating the use of HDR with HDTV. (Above) Illustration from John Humphrey’s presentation: SDR image at left, HDR simulation at right. UHD/4K and High Dynamic Range (HDR) are usually mentioned together, but HDTV can also benefit from HDR because most people sit too far from their TVs to see the full resolution of UHD/4K. A properly set up 1080p image with HDR will look better than a UHD image with Standard Dynamic Range (SDR) at typical viewing distances. John also covered HDR format compatibility with existing SDR TVs and how viewer experiences can be enhanced with different HDR standards. John explained the reasons that High Dynamic Range (HDR) is not limited to Ultra HD. HD-HDR can be delivered in a compatible Hybrid Log Gamma (HLG) to both legacy SDR and 4K HDR TV sets. It recovers detail from dark shadows or bright areas and offers a more realistic picture. The HD signal will pass through nearly all the bandwidth and data rate issues that have slowed the adoption of UHD/4K. HD-HDR can be delivered by satellite and OTT providers and will be upconverted at the consumer’s UHD TV. If HLG is used; no metadata is needed. For PQ, metadata will trigger HDR processing in the upconverted picture. The Z-HD5500 joins the line of Hitachi HD and Ultra HD camera systems offering High Dynamic Range (HDR) capabilities, enabling video productions with increased contrast, rich colors and enhanced lighting reproduction. Click on image for a demo. 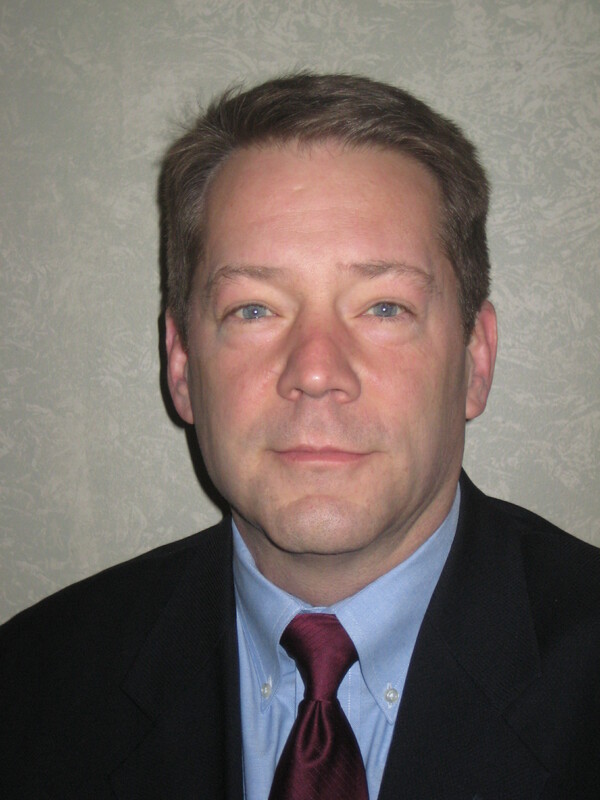 John Humphrey is Vice President, Business Development at Hitachi Kokusai Electric America. He has spent his life in radio and television working in maintenance, operations and as Chief Engineer at multiple broadcast stations and production houses. He has designed, built and operated mobile production trucks as Engineer in Charge. His experience includes sales and business development at dealers, manufacturers and system integrators. During the last three decades in equipment and system sales, he has developed a deep knowledge of the business and technology. John is a life-certified SBE CPBE and a SMPTE Section Manager. His presentation is on Emerging Video Technologies. Specifically, High Dynamic Range for HDTV. 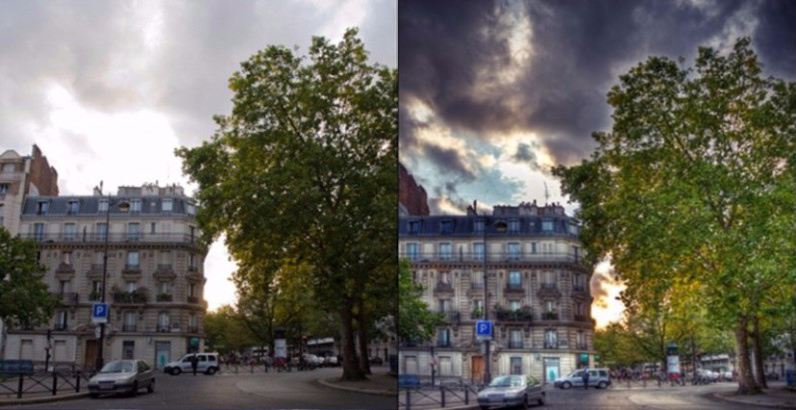 Why HDR and What is HDR? At the May 2017 Meeting on the 25th, Broadcast Supply Worldwide and INSOFT LLC introduced the new HDV Mixer. INSOFT LLC President Alex Bonello. for a lively and informative demonstration of the new HDV Mixer, a product developed by INSOFT expressly for broadcasters to connect their stations with social media via Facebook Live. The new HDV Mixer Visual Radio solution is what broadcasters have been dreaming of. 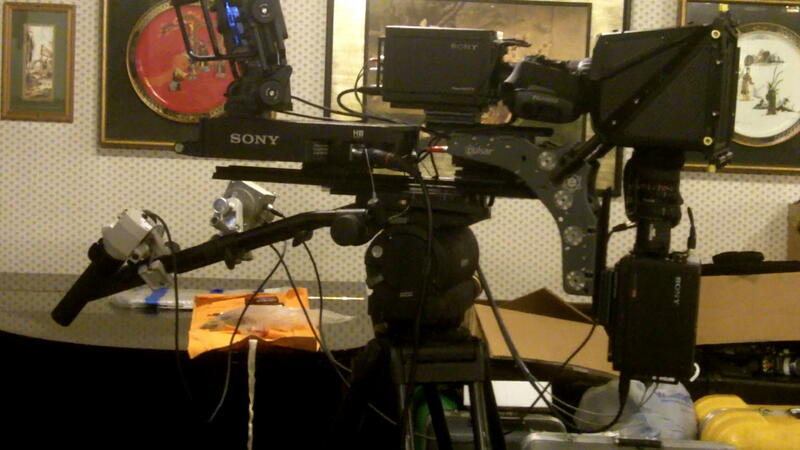 Filling the gap between video content production and radio broadcast operations. Built-in multiviewer, video switcher, character generator, video streaming encoder, video recorder, social media integration, video ad replacement, and more. Alex conducted the demonstration on how this is setup, how it operates, and conduct a live demo. And, John brought us more new products shown at the NAB Show in Las Vegas last month. Once again we met at the Dunston’s dining room at 7pm for drinks followed by a Great Menu of their best entrees and outstanding Desserts. Nautel and RF Specialties have been partners since 1981 and RF Specialties brings Ellis Terry in from NAUTEL on a regular basis to keep us up to date on this major manufacturer in the Radio field. Nautel has emerged as one of the world’s largest manufacturers of radio broadcast transmitters with more than 12,000 deployments in 177 countries. The new NX Series of 5 and 10kW AM Transmitters is the culmination of years of Nautel digital/analog transmission innovation and won the Best of Show at NAB this year. Bring a friend or colleague each month and learn. Dinner at 6pm was followed by some Chapter announcements including: the return of the Shockwaves Newsletter headed up by Wayne Kube, some improvements to the website including an Equipment Exchange Page and interest in Chapter sponsorships. Mark’s Presentation followed at 7pm at Gilligan’s. Since its founding in 2004, Silvus has become the leading developer of complex MIMO wireless technologies which are expected to reshape broadband wireless connectivity worldwide. 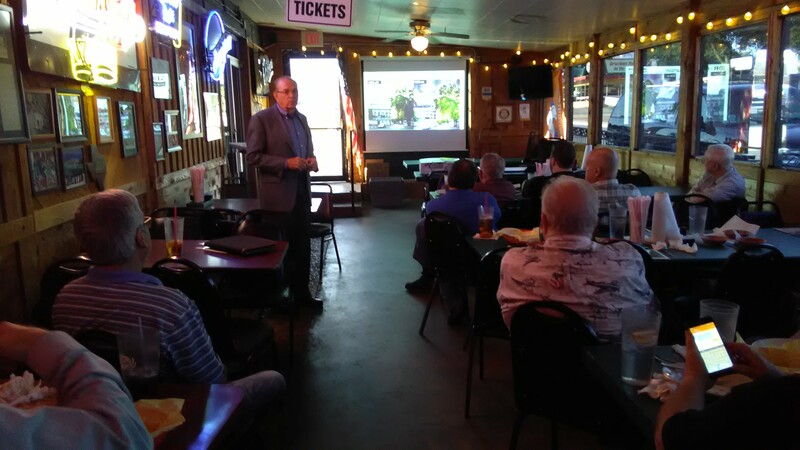 Using the experience of Fox $ in Dallas, he discussed the Silvus mission of bringing the revolutionary benefits of multi-antenna MIMO techniques to the transmission of high fidelity data and video into harsh conditions characterized by severe multipath, interference and spectrum congestion. Over the years Silvus has assembled a world class team of experts, handpicked for the excellence they provide in their areas of core competencies. We have meshed these experts together to deliver a technologically superior radio solution that delivers in the most demanding applications, at an unprecedented size, weight, power, and price point. Our meetings are FREE, casual and open to anyone interested in a better future in Radio, TV, Audio/Video Production, IT and all the related fields. SBE Membership is not required (but you’ll probably want to join eventually) – and we all get together on the last Thursday of each month.Always bring a friend or colleague each month and learn. regarding the FCC’s Audible Crawl Rule. Rule 21CVAA for 6 months and it has now been delayed until November 30th. In accordance with equal services for disabled persons, the FCC has mandated that any textual emergency information that is crawled as text in television broadcast must also be played aurally on the secondary audio program or SAP channel. Jacob’s talk focused on the intricacies of developing effective systems for broadcasters to comply with the mandate and what types of tools are available on the market today including some demonstrations of actual voice from text systems. 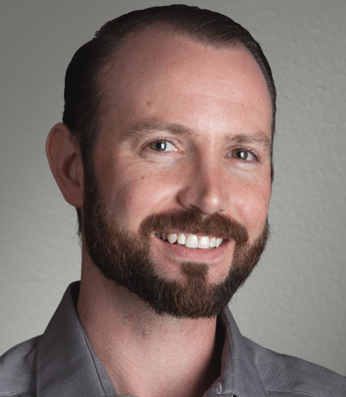 For the last 7 years, Jacob has been the Central US Sales Manager for Cobalt Digital, provider of video and audio infrastructure for the live television broadcast market. During his time at Cobalt, Jacob has worked with with many broadcasters and station groups to successfully implement FCC mandates for CALM and Closed Caption compliance. With the recent release of Cobalt’s new Text-to-Speech generator on an advanced audio routing platform, Jacob has helped over a hundred television stations comply with the new rule already. 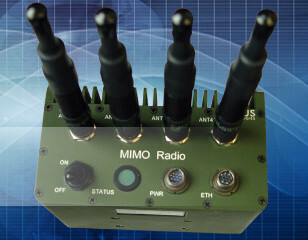 RFS serves OEMs, distributors, system integrators, operators and installers in the broadcast, wireless communications, land-mobile and microwave market sectors providing RF Systems solutions for cell-based mobile communications, in-building, in-tunnels, television & radio, radio-link networks, LMR/PMR and HF & defense. Dan also reviewed the Nautel line of FM Transmitters and the new Nautel TV transmitters. 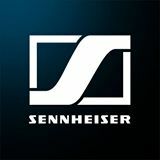 did an informative and engaging presentation for the crowd on wireless mikes – their history, present and future – highlighting the latest products from the Sennheiser family, new frequency use information and all the details. Dave Davis was presented with a pin from the SBE National in recognition of his work as Certification Chairman. Our Host: Raymond Allen is the Area Sales Manager for Sennheiser’s Systems Integration division, covering all of Texas, Arkansas, Oklahoma and Louisiana. His formal education at Ouachita Baptist University centered on TV Broadcasting and Journalism. He has worked in the A/V industry since the early 80s doing large format concert touring, as well as sales and design of commercial audio systems. 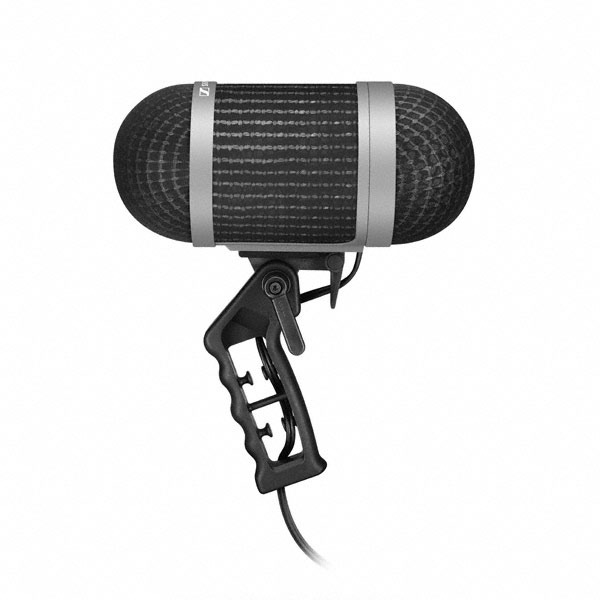 He has worked extensively with wireless microphone and has a good grasp on the history and future direction that is coming to wireless microphone technology. In this presentation he discussed several topics from the viewpoint of a leading manufacturer of wireless microphones. Including major changes to, not only the frequency ranges in which they will be able to operate, but also the technology that will accompany these changes. We discussed the movement from analogue to digital transmission, what frequency ranges will be available for use and the trade-off for each of these changes. 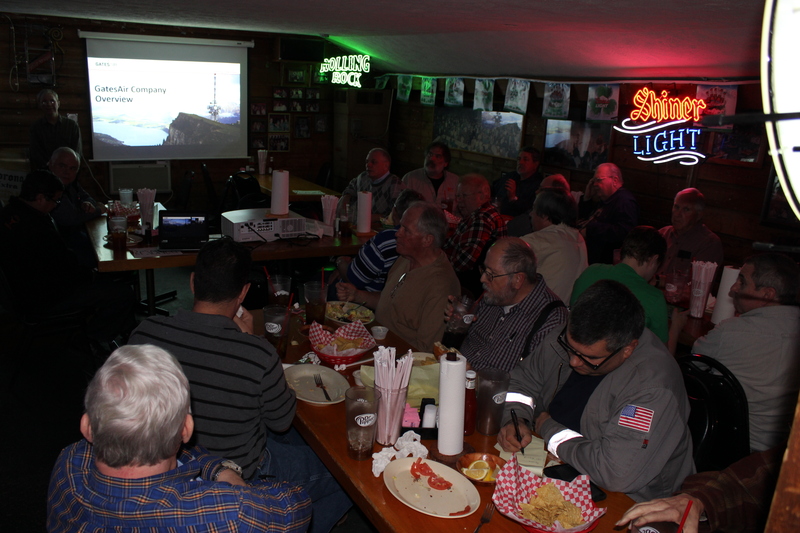 The March Meeting was on March 26th, 2015 at Gilligan’s. New Officers were elected for Chapter 67. Click on the Chapter Info Tab above for more. presented a program on Monitoring & Management Systems, focusing on the proper feature set for technical monitoring applications. 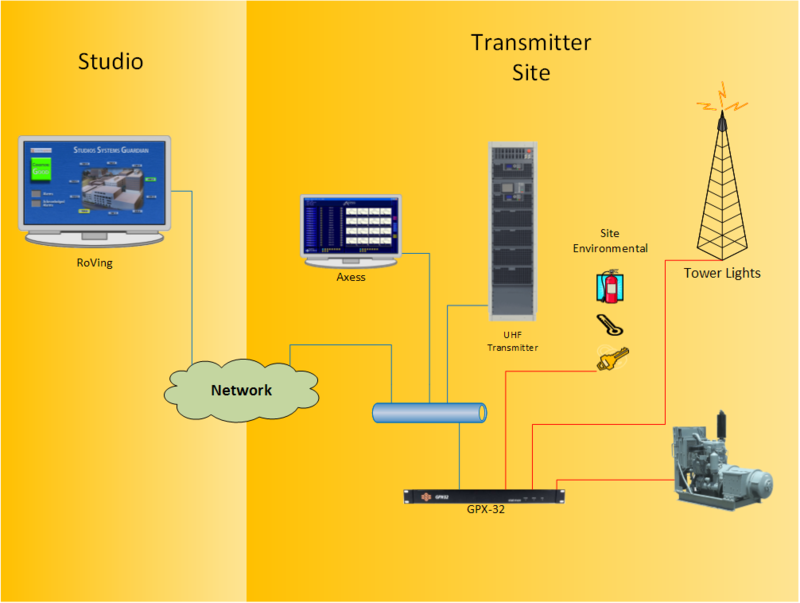 For many broadcasters, the primary and largest application for fault monitoring is the Transmitter Remote Control system. Additionally, Full Facility monitoring is growing in various forms at radio and TV facilities for Studio and MCR power and facility management and network health monitoring. Many monitoring applications in use are provided by proprietary hardware manufacturers and some are facility or network based. This presentation outlines proper feature sets for monitoring systems and how consolidated monitoring environments can work. When the technology is properly applied, a more efficient response by engineers to fault occurrences is prevalent. Many stations in this market use the SuiteLife Statmon AXess System. 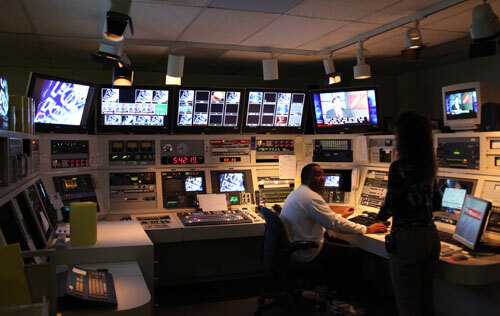 With the aid of visual data displays operators may be involved, allowing engineering a greater focus to support the business of news or program production. SuiteLife Systems, a division of NFB Consulting is a leading solution provider for Management, Monitoring and Control solutions specializing in the integration of facilities and disparate systems and equipment across multiple site networks up to a single screen. Nexidia is an amazing search product for locating media in your library in seconds. The spoken word – narration, dialogue, etc. is both the richest and the most under-developed source of metadata in digital media. Turning that spoken word into searchable, time-based metadata has always been costly and time consuming. Nexidia’s patented dialogue search, alignment and analysis technology finds words or phrases which are spoken in either live or recorded media streams. 100,000 hours of media can be searched in under a second. Even transcripts and captions can be timed within 100th of a second. 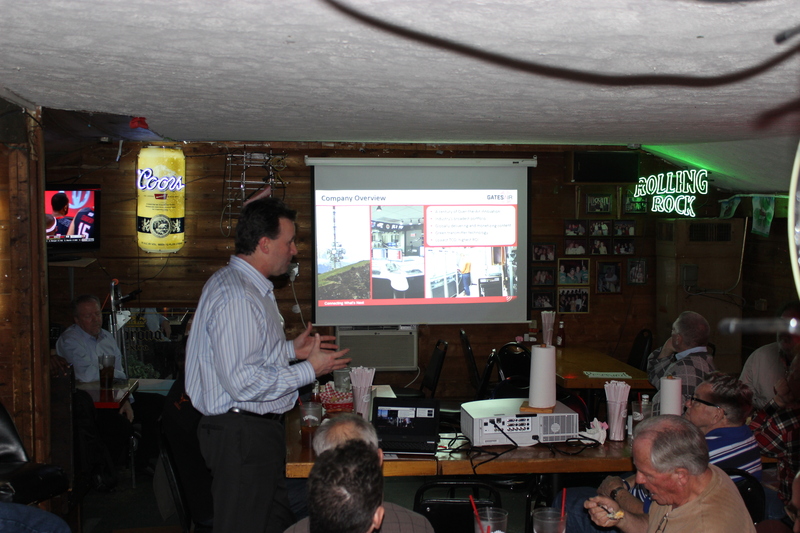 and Ron Lane – District Sales Manager presented a full program to a full house. Henry C. and Cora B. Gates founded the Gates Radio & Supply Company in 1922 in the kitchen pantry of their apartment in Quincy, Ill. This meeting brought us all up to date about what has happened since then ……. 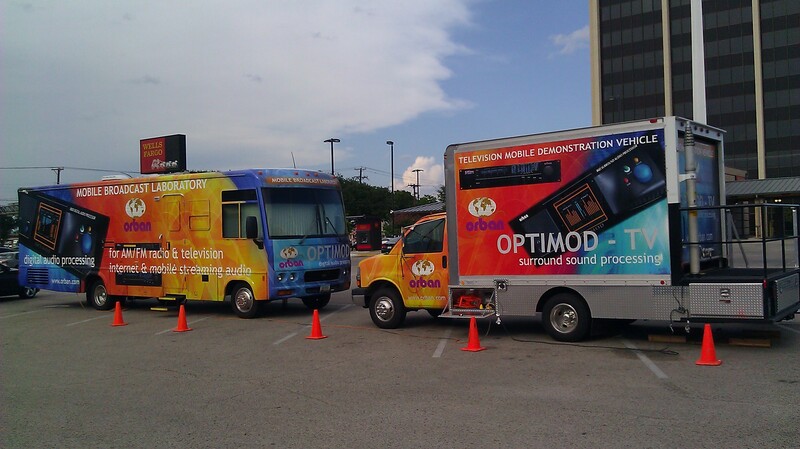 Everything in Radio and TV equipment including complete turnkey installations from microphone to antenna. ……. The presentation focused on the newest trends in monitoring, testing and measuring tools, essential for the maintenance of any station. FCC and iBiquity compliance masks – for radio as well. In this day and age, with less technical support staff and shrinking budgets, everyone is looking for smaller, lighter, more versatile and easy to use devices that are affordable. This testing tools update will guide you through the newest ideas and solutions from several innovative manufacturers. Do not miss this opportunity to get up to speed in monitoring, testing and measuring! About the Presenter: Eddy has Belgian roots, holds an MSEE from the Erasmus University College in Belgium, and is fluent in four languages. He has 30 years of experience in consultative sales and sales management of RF, microwave, audio, radio, TV and video Test & Measurement instruments, as well as TV broadcasting equipment. 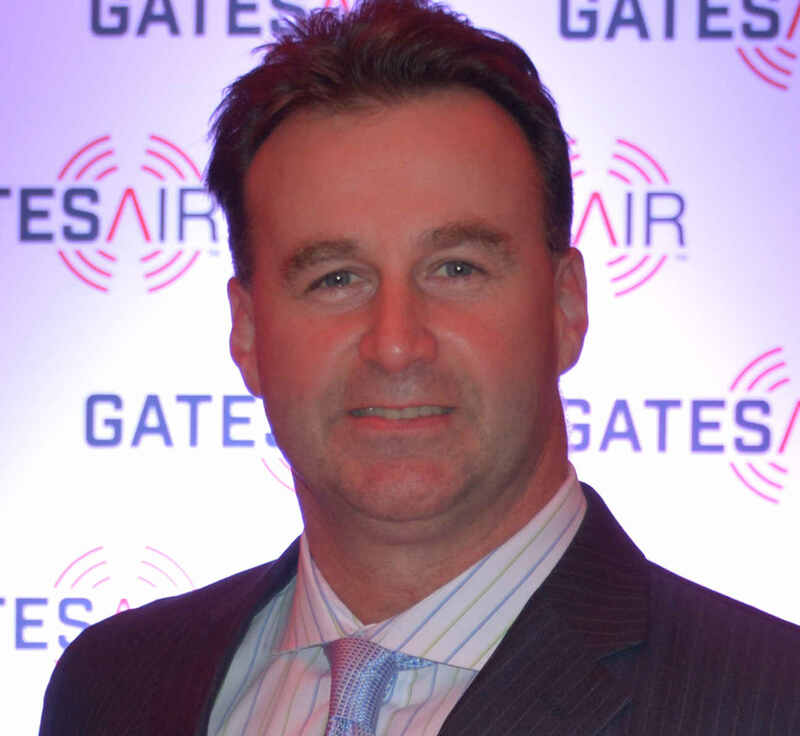 For the last 10 years, Eddy was the Director of Sales for the Broadcast Division of Rohde & Schwarz USA. Prior to transferring to R&S USA in 2001, he sold T&M products for R&S Belgium. 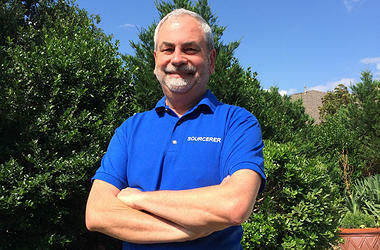 He founded SOURCERER, LLC broadcast product sales in June 2014, based in Flower Mound. Bring a friend or colleague this month and learn. at American South Tower on Tar Road. at DFW’s newest TV transmitter installation demonstrating the Rohde-Schwarz THU9, Doherty-enabled, high-efficiency and high-power TV broadcast transmitter without tubes or high voltages. The new facility is complete with UPS and Generator power systems and a unique IP-Based, networked STL Microwave System. And, the meeting also included an overview of file-based workflows by Rob Fox. Pictures are on the way of the large group enjoying a great Roscoe’s Barbeque Dinner and meeting the people who built this cutting edge site. Matt and David Sanderford from Marsand who did the complete installation, Chief Electrician Larry Wilcoxin, Cory Edwards from Dielectric along with Graziano Casale, Glen Hurst and Walt Gumbert from Rohde-Schwarz were there to give the inside tour and answer any questions. Our meetings are FREE, casual and open to anyone interested in a better future in Radio, TV, Audio/Video Production, IT and all the related fields. SBE Membership is not required (but you’ll probably want to join) – and we all get together each month. Join us for Dinner at 6pm followed by the Presentation at 7pm. You can meet some of the areas most experienced Broadcast Engineers and some of the newest and you’ll always learn something. 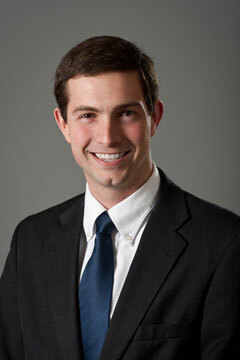 RF Specialties is happy to bring Ellis Terry in from NAUTEL. 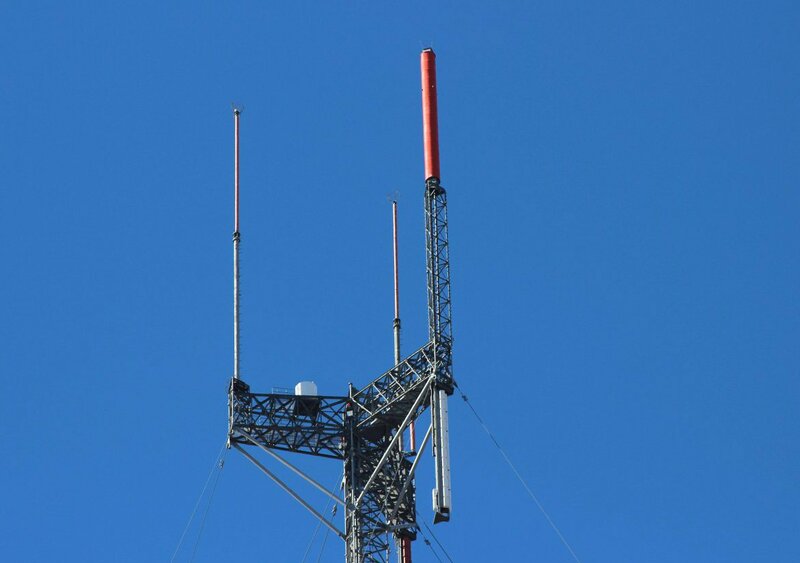 Nautel has emerged as one of the world’s largest manufacturers of radio broadcast transmitters with more than 12,000 deployments in 177 countries. 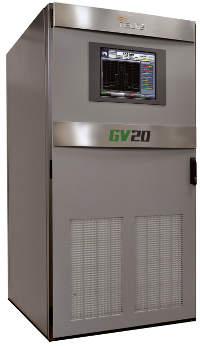 The new GV Series is the culmination of years of Nautel digital/analog transmission innovation and the winner of two Best of Show Awards at NAB. Ellis reviewed the Nautel Coverage map program, something that is free to all, how it works, its functions and capabilities. He also talked about the new GV Series FM transmitters and other Nautel products and answered questions. Nautel provided dinner. Nautel and RF Specialties have been partners since 1981. Sencore is a world class technology company focused on engineering, marketing and delivering innovative and reliable products and services for professional broadcast, satellite, cable, IPTV and content providers to enable efficient, high quality video delivery. Also, the 50th year commemorative video presentation on the history of the SBE from National Headquarters. With the job market changing, this program helped understand what Professional Certifications are available, why you might need one and how to prepare for and take the exams. SBE Certification and the long list of – SBE Educational opportunities – many of them FREE – can help you stand out from the crowd by adding that extra spark to your resume. 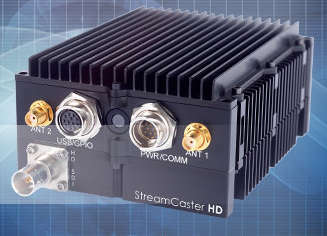 With the proliferation of HDMI devices destined for use in the broadcast environment, cleanly routing, integrating and switching between HDMI and SDI sources can be a challenge. Not only do the HDMI signals need to be switched cleanly and instantaneously, but also need to be available along side SDI signals from traditional sources. This presentation outlined the characteristics of HDMI connections (which differ greatly from SDI connections) routing switcher architecture to incorporate HDMI as well as SDI sources and the proper frame sync design to provide consistent, instantaneous, clean and quiet switching using HDMI and SDI sources in a routing environment. John demonstrated the brand new BrightEye NXT 410 Compact Router with appropriate sources to demonstrate the architecture described in the presentation AND everyone was able to get up close and personal with this sophisticated piece of technology. 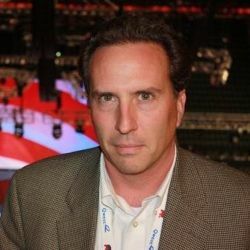 Our Presenter: John Pichitino is Technology Evangelist for Ensemble Designs in Grass Valley, CA. Before joining Ensemble, he was founder and CEO of PichPix, a post-production services company. Before he started PichPix, John was the Director of Marketing for ImMIX and Scitex Digital Video, manufacturers of broadcast non-linear editing equipment, and Senior Applications Specialist with Grass Valley Group digital switching and effects. He’s also an award winning video editor and served as Production Manager at broadcast facilities in the Miami and New York Markets. Following a discussion about the upcoming Officer Elections, the Presentation and Discussion included: An Introduction to the various Vislink Family Companies, ENG’s future in Multimode operation – ENG/CNG/SNG/?NG, a BAS Spectrum Update and an open discussion. Our thanks to John for a good overview and informative discussion of many of the AJA products from Frame Syncs, Routers, Format Converters and some 4K devices. AJA offers full line of AJA Format Converters, Recorders, Routers, and some Signal Processing and after the presentation we had some hands-on experience with some of them. The discussions lasted well after the meeting ended. Thanks to Tim Davis at Digital Resources for arranging this program. Great Christmas Party on Tuesday December 10th 2013. We met in the same private dining room as last year, starting at 6:30pm with drinks followed by a Great Menu of their best entrees and outstanding Desserts. Chapter 67 offers our thanks for this wonderful event and Dan’s consistent support for our Chapter! Lukas highlighted products like the Inovonics Model 730, Their flagship RDS Encoder that connects with virtually any playout system including Station Automation interface over IP network. It supports Ratio Text Plus, ‘song tagging’ and and other advanced applications(LAN or Internet) or by RS-232 serial link. He also demonstrated their Logging system to verify every RDS event ran as scheduled. And, the new 610 Internet Radio Monitor – a dedicated hardware solution for uninterrupted monitoring of streaming online radio quality and performance with Pro Audio outputs. The September Chapter 67 meeting was on the 27th. 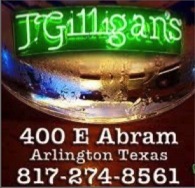 at J. Gilligan’s 400 E Abram in Arlington, TX. Dinner at 6pm and the meeting at 7pm. Broadcasters have been needing and asking the FCC for more channels and bandwidth for years now. We need more! With the growth of HD audio and Video the need for reliable STL’s continues to grow every year. In August of 2011 the FCC abolished the last link rule opening up Part 101 licensed frequencies to broadcasters. Finally the FCC has opened up new frequencies that can be used for reliable STL’s. These frequencies like 950mhz, 7ghz, and 13Ghz are licensed frequencies but with the ability to run high speed bidirectional data rates. They have the ability to provide up to a gigabit of bidirectional throughput to your transmission sites. With multiple channels and the growth of HD in today’s broadcast industry, higher throughputs are needed. IP Microwave is the latest technology for broadcasters to carry their content to transmission sites. This can be achieved in the unlicensed 5.8 GHz frequency or in the recently released Part 101 licensed frequencies of 6,11,18, and 23 GHz. As our world moves more and more to Internet, IP Microwave will reach farther and connect faster to remote sites, and extend your LAN to the outmost points of your network. IP microwave solutions are high speed, bi-directional, and have low latency. This allows you to upgrade your transmission sites with VoIP and video security without impeding the broadcast traffic. With the proper design and integration an IP Microwave STL can be more reliable than any other solution on the market today. As time proves makes this clear to the market, IP Microwave will be responsible for eliminating more and more leased lines. Broadcasters have been needing and asking the FCC for more channels and bandwidth for years now. We need more! 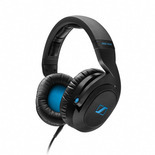 With the growth of HD audio and Video the need for reliable STL’s continues to grow every year. In August of 2011 the FCC abolished the last link rule opening up Part 101 licensed frequencies to broadcasters. Finally the FCC has opened up new frequencies that can be used for reliable STL’s. These frequencies like 950mhz, 7ghz, and 13Ghz are licensed frequencies but with the ability to run high speed bidirectional data rates. These frequencies have the ability to provide up to a gigabit of bidirectional throughput to your transmission sites. This webinar with instructor Jeff Holdenrid was designed to inform you on these new licensed frequencies and the design do’s and don’ts for these frequencies. The webinar also looked at a live path profile showing what can be done today. The August meeting was Thursday the 29th. 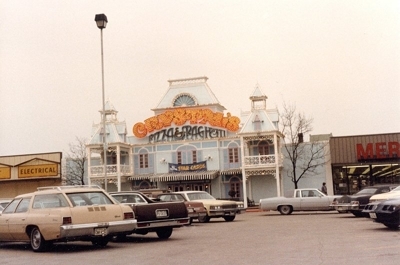 We were at J. Gilligan’s 400 E Abram in Arlington, TX. Dinner provided at 6pm and the meeting at 7pm. He explained how the development of BRIC Technology has made the use of inherently “fragile” data networks, such as the public Internet, capable of delivering live, real-time, full duplex and dependable broadcasts. Chris also discussed their new CrossLockT VPN Technology, as well as other Comrex advancements, and how they complement new wired and wireless data technologies to provide broadcasters with a stable operating medium for delivering real-time, high quality remote broadcast content. Chris Crump began his professional radio career in 1987 as a producer at WHYT-FM in Detroit before his work as an editor for the Mediabase Research radio trade magazine Monday Morning Replay. He went on to serve as a Remote Broadcast Engineer then Creative Services Director for Capitol Broadcasting (and subsequently Paxson Communications) in Orlando as well as the Ron & Ron Radio Network in Tampa. Since 1996 he has served in sales capacities for Euphonix, Symetrix and Klotz Digital. He has been Director of Sales & Marketing for Comrex Corporation since 2004. Chris, his wife Seval and 8-year-old daughter Zara, live just north of Atlanta where his is a member of SBE Chapter 5 with CBNE certification. A presentation how IP Connectivity has impacted Remote Monitoring/Control installation planning, how quickly upgrades can be done and the impact of Smartphone access and Environmental Monitoring. Climate Guard to monitor temperature, humidity, flood/leak and other environmental conditions that can cause serious data disasters. Digital Rapids, founded in 2001 and headquartered in Ontario, Canada, develops new Products and Core technologies for: Transcoding, Streaming, Workflow Automation and Management . Kayak is the technology foundation powering the newest solutions for end-user applications – including the Digital Rapids Transcode Manager high-volume media transformation software and the StreamZ Live 8000EX integrated multiscreen/broadcast live encoder — and is available as a comprehensive workflow development platform for customers, systems integrators and software developers. Their solutions are the preferred choice of thousands of customers worldwide, from leading broadcast networks, motion picture studios, multichannel video programming distributors (MVPDs), online content portals and post production facilities to Fortune 500 corporations, government agencies, universities and houses of worship. Gary Tibbot from Broadcasters General Store Co-Sponsored the meeting but was not able to attend due to airport delays in Memphis. From a complete studio rebuild to a handful of connectors, BGS has supplied equipment to the broadcast industry since 1979. And it’s been family owned since its inception. 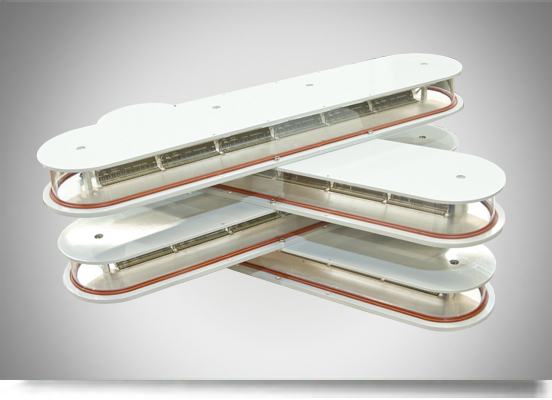 Dialight makes everything from small Board mount indicators to massive LED structural arrays. While focusing on Tower Obstruction Lighting Systems, Les explained the advantages of LED Lighting in general and compared the power cost savings betwen the major systems in use today as Tower Lighting: Incandescent, LED systems and Xenon. He also covered a new LED Based, white high-intensity strobe LED system –shown at left. AND how Dialight’s lighting optics differentiate them from other lighting companies. Dan Sessler presented an interesting look at RF Specialties – from their beginnings to now, the offices across the country and their Systems Integration business. to the group present at Los Lupes and on-line via Go To Meeting. and a discussion of practical implementation of it so far. Scott Howard has been with Tektronix for 32 years holding technical support positions in manufacturing, product marketing, Government marketing and sales. He consults and teaches test methodologies for Broadcast, Studio, Cable and Manufacturing throughout North America. Today, Scott consults and teaches test methodologies for Broadcast, Studio, Cable and Manufacturing for customers throughout North America. Our thanks to Tony Copley, Tektronix Sr. Account Manager for Video Test Solutions for adding to the discussion and for providing Dinner. An election Committee was selected to work on the upcoming Chapter Officer’s Election. Dave Davis, Cliff Erickson and Buddy Brown will be formulating a Ballot for the March Meeting’s Election. 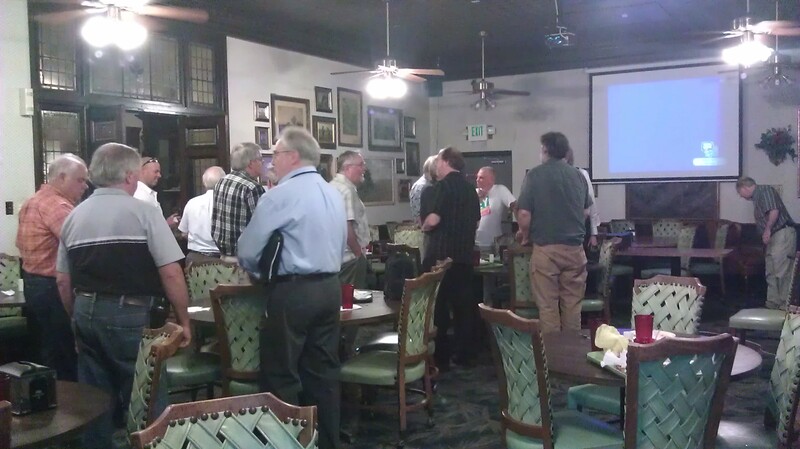 The October Chapter 67 Monthly Meeting was held on October 25th. 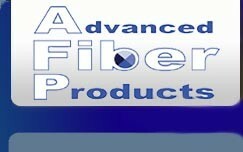 It was a great program on Fiber Technology at Crystals. 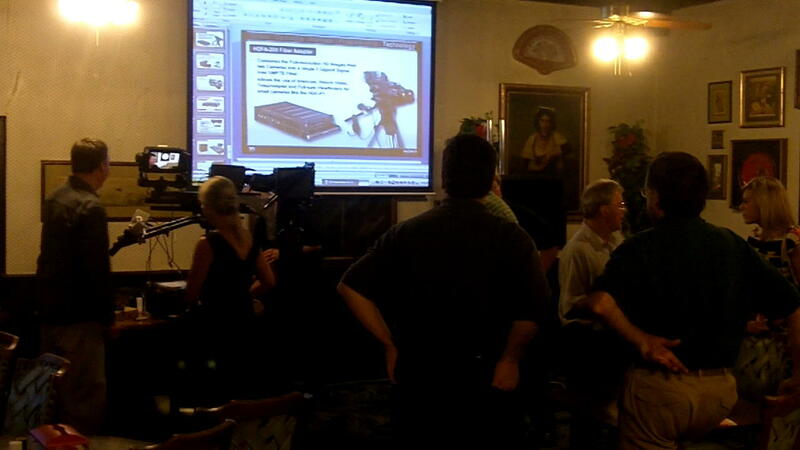 Our hosts provided the dinner and after the main presentation, we all watched a live fiber cable termination demo. exlained how his company is known for superior quality and reliability in broadcast cable and infrastructure. As bandwidth increases and broadcast equipment moves more towards IP platforms, cable infrastructure is changing away from HD coax and multipair audio towards fiber optics and category cabling. Eric reviewed the basics of good fiber optic installation and handing procedures. The presentation also included a look at connector types / applications, as well as fiber optic transport / multiplexing. reviewed why his company has for years been the go to source for infrastructure for IT professionals. Their revolutionary “layer zero” method of planning dense server rooms such as data centers and broadcast closets, sets the standard for planning a solid infrastructure that is efficient from a heat and power standpoint and is expandable for future growth. All these topics as well as performing a fiber optic termination demonstration with their state of the art “Lumen” connector by Ortronics. Excellent and Educational for everyone there! 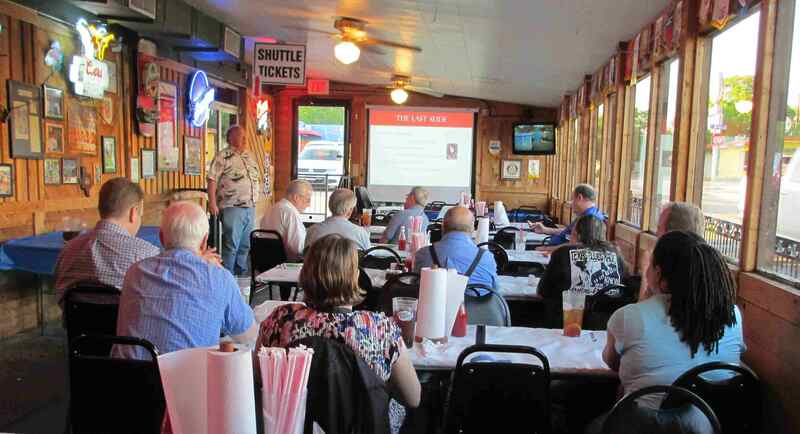 The September Chapter 67 Monthly Meeting took place on the 27th. The Topic: Fiber Optic Technology Today. Our thanks to Mike Buchanan, Senior Field Applications & Sales Manager with Advanced Fiber Products for an informative meeting and Q & A after the session. Fiber technology has changed dramatically in the past 10 years and Mike walked us through the various forms of Fiber, connectors, converters and Mux systems in use today. Among the Video Broadcast products Mike demonstrated, there were some unique items for ENG use: Ruggedized Cable Assemblies for field use that can tolerate military tank trak and tire crushing without damage; Media Converters for various video and Ethernet formats; a new line of Secure Optical Connectors; and Portable Remote Hubs for News Gathering. At the August Chapter 67 Monthly Meeting on Thursday the 30th. Presented in partnership with RF Specialties with 14 Offices across the country. Using an operating AT8001 exciter, Warren demonstrated real life effects of poor amplifier response, nonlinear amplifier distortions, filter group delay and poor transmitter performance on Signal to Noise Ratios, Modulation Error Rate ( MER) and FCC compliance mask challenges. He demonstrated how correction techniques improve overall digital performance, even in marginal/older transmitters. 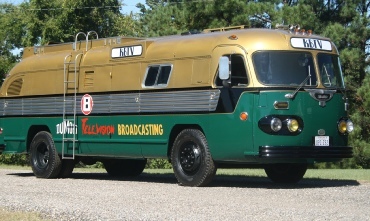 The demonstration covered ATSC TV signals, but the techniques, discussions and evaluation apply to radio as well as all types of RF amplifiers. 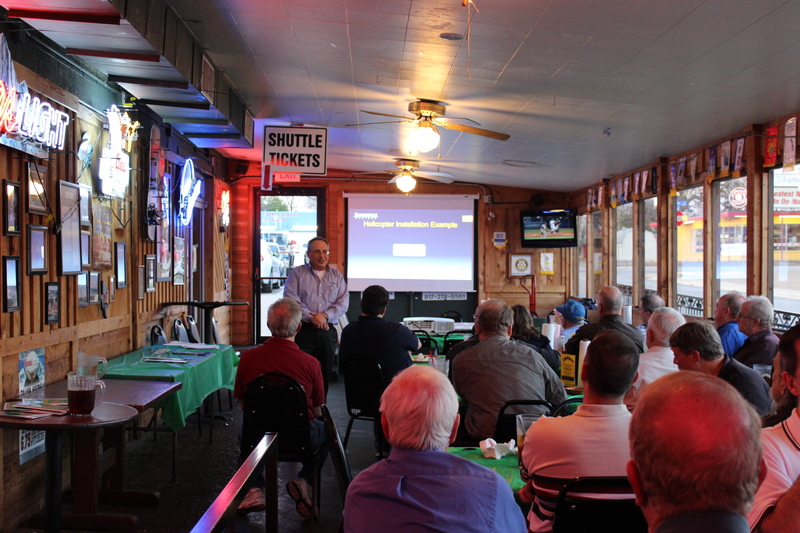 The big crowd at our July 26th Meeting had an unusual learning opportunity – to hear from Bob Orban. Bob Orban reviewed various Loudness Measurement techniques developed through the years and explained some of the difficulties ahead in complying with the new C.A.L.M Act which is to be fully implemented in December. After the meeting – an opportunity for “Hands-On” in the Orban Mobile Broadcast Laboratory – a mobile vehicle converted to permit testing and demonstrations of Orban Radio, TV and Production products and do comparisons with other products. Equipment on-board includes: The new Optimod 8685 Digital 2nd generation Television Surround Audio Processor, The Optimod-PC 1101 and the FM Optimod-FM 8600. 8304 Esters Blvd., Ste 870, Irving, TX 75063.
and the meeting at 7! Thanks to all who attended, got involved and participated in a good discussion about the future direction of the Chapter and the organization. Tom will be taking that input to the planning meeting at National HQ this month. 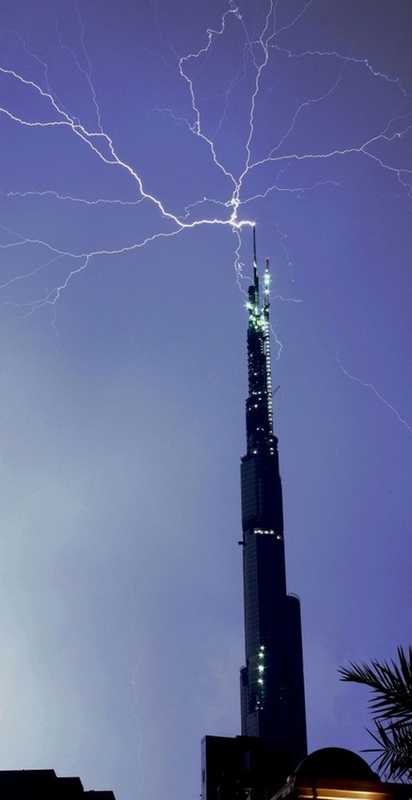 Storms can get to your tower and antennas if they’re not protected. and Javier Castillo of LBA Technologies came to the meeting with some real, proven solutions. He explained how LBA, with over 40 years experience worldwide in lightning protection of AM, FM, and TV towers and antennas and wireless mobile sites, has the expertise to design and furnish the best protection for these systems. We were at Crystal’s Pizza and a BIG THANKS to Dan Sessler of RF Specialties for providing dinner for everyone. And, as an added feature, we celebrated Jerry Ernest’s Birthday by helping him eat a big cake. A few of their many products include: MediaFire and NewsBank MCR and News Automation, MediaVault “Cube” for LTO or Blue-ray based fast Archiving, MediaView for continuous recording and verification of off-air feeds and SafetyNet an On-site or Off-site Total Disaster Recovery System. * * * * * Members participated in the Chapter Officer Elections. Chairman Tom Schuessler and Secretary Joe Carter were re-elected, Bill Ryan is Treasurer and the Vice-Chairman position remains temporarily open. We were back at Crystal’s Pizza – 930 West Airport Freeway in Irving for Dinner at 6 and Meeting at 7pm. Dan Sessler who was also on hand from RF Specialties of Texas. we toured the Continental plant in Dallas. Thanks to Mike Troje for dinner, a short presentation and Q & A with Continental’s field service technicians Richard Garrett and John Hutson on common support issues and the plant tour with the latest HD Radio Products and some of Continental’s big, high power rigs under construction and test. Bill Wise passed away on December 27th. Bill was a co-worker and friend to many of us in the DFW area and will be missed. At a memorial party on Saturday January 7, 2012, at The Ranch House in The Colony, friends and colleagues gathered to celebrate the endless memories of Bill. Featuring Gary Sgrignoli DTV Transmission Engineer with Meintel, Sgrignoli & Wallace. Attendees from all over Texas and several other states attended a full day of quality instruction and education and received In-Depth Seminar Notes and Reference Material contained in a 750 Page Handbook were provided to all. This outstanding seminar presenting the ATSC’s digital television (DTV) vestigial sideband (VSB) transmission system fundamental concepts & measurement methodologies for broadcasters, consultants, Broadcast, Consumer and Test Equipment manufacturers, translator/LPTV operators and cable operators. 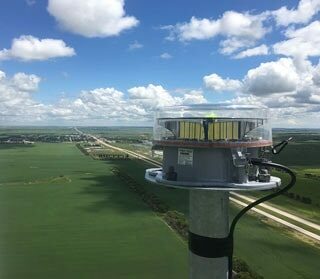 and designed to develop an understanding of 8-VSB transmission system basics as well as measurement techniques in the laboratory, at a transmitter site, and at remote field test sites. Practical test equipment information Use Features & other performance requirements were covered as well as new information on mobile/handheld DTV devices and Distributed Transmission. NOTE: Attendance at this seminar earned one SBE credit towards re-certification. On September 29th, Chapter 67 presented a Live Streaming Event. A special thanks to ProAudio.com for providing live streaming using the NewTek Tricaster TCXD-850 Extreme, the all-in-one solution for simultaneously switching, recording, projecting and streaming up to 8 channels of HD video. ProAudio.com, formerly Crouse-Kimzey Company, is NewTek’s elite dealer in north Texas and an SBE associate member and supporter. The presentation ran live on the internet starting at 7pm from KDTX Studios, 2823 W. Irving Boulevard in Irving. 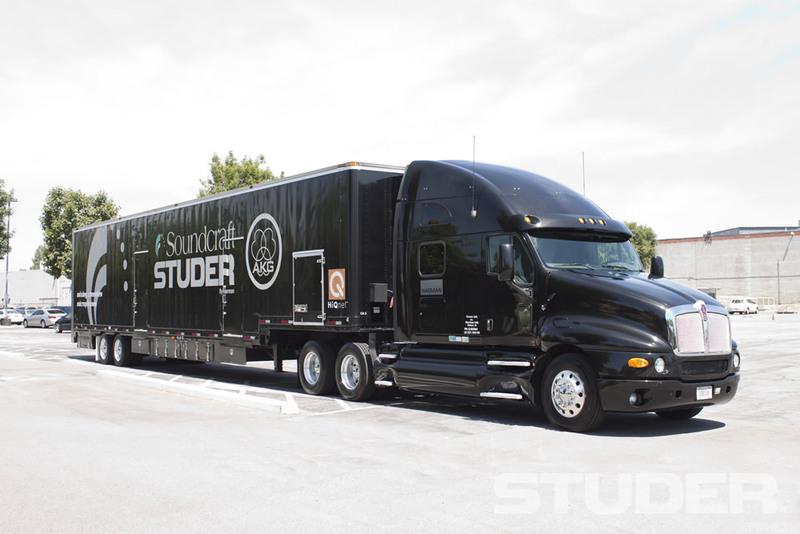 As an added feature Katy Templeton-Holmes from Harmon International/Studer whose huge demo/training truck was on site at KDTX as part of their “Texas Tour” for the Studer Broadcast Academy and open for viewing after the meeting. Studer is holding a full open house and offering training classes on the 29th and 30th. Digital Media dominates the world of audio and video today. Never before has audio and video been so easy to transfer, access, and customize. It is important that everyone working in broadcasting be familiar with the newest way to handle media and how to get it to the audience using compression and streaming technology. The realm of media encoding and streaming is complex, but using it does not have to be difficult. This presentation provided an excellent overview of how encoding works, how it is transferred inside a production facility, and how it is then served to an audience on the internet. Starting with the nuts and bolts of streaming media. Key points included containers vs. codecs, common types of codecs, buffering, sync, data rates, compression ratios and bandwidth considerations. Audio and video examples were shown to the attendees in house and on the stream to demonstrate the qualitative properties of encoded media. The second part focused on the incorporation of compression, streaming, and workflows in university curriculums, and the challenges faced by faculty, staff, and students adopting multimedia standards to reach a worldwide audience. Joseph W. Carter, CBNT is the Manager of Technical Operations and Engineer at the University of Texas at Arlington Department of Communication and anchor/reporter at WBAP. Joe has a diverse background in broadcasting and digital media. 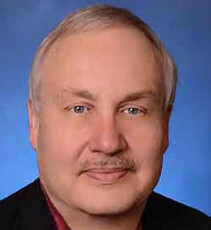 His specialty is media encoding, IP delivery and the study of today’s merging IT-AV workflows. Joe has given presentations on the emergence of Internet radio stations and how they will carry radio into the 21st century. 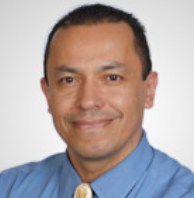 Julian M. Rodriguez, MA is an experienced videographer and journalist, specializing in electronic news, TV technology and current media issues. 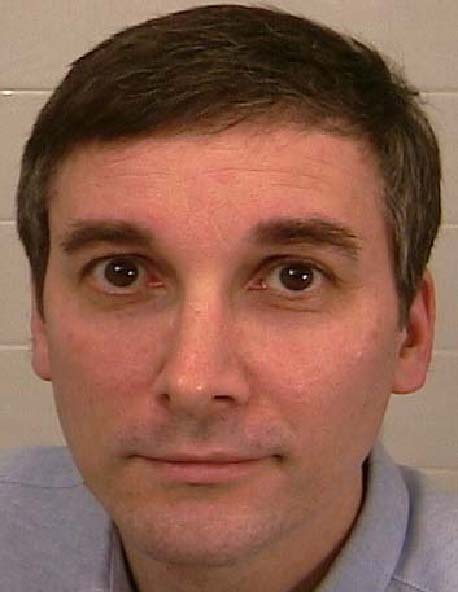 He is a lecturer at the University of Texas at Arlington Department of Communication. He teaches Video Production, TV Reporting and Modern Issues in Telecommunications and specializes in digital media formats, capturing and publishing. He has given many presentations on the use of ‘new’ media and its implications on the industry. Solutions to Today’s Video Delivery and Quality Challenges! Scott Howard from Tektronix presented innovative test solutions and current tips on tackling today’s video challenges. Demonstration and Presentation Topics covered by Scott included: 3D TV, Loudness and the CALM Act, MPEG & Video Quality, Closed Captioning, Ancillary Testing and Analysis. 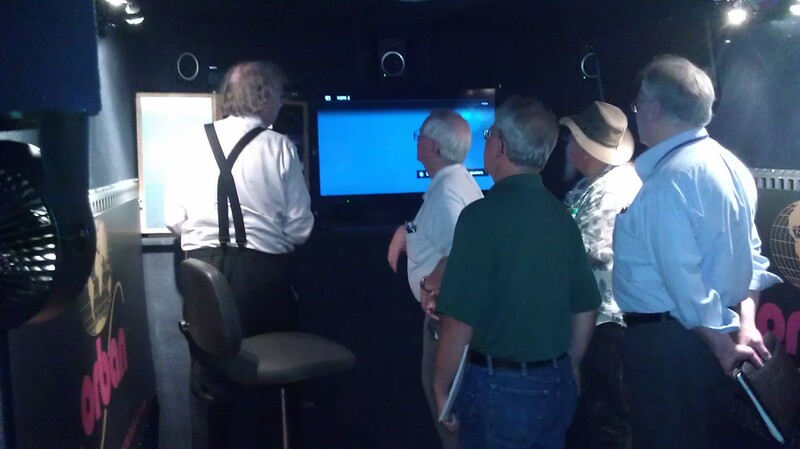 After the presentations there was an insiders tour of the Cowboy’s Broadcast Facility and attendance to the Tek VideoInsight Seminar counts towards 1 credit of category H of the Society of Broadcast Engineers recertification program. Specializing in the latest technology in UPS systems – large units for Transmitter sites to small units for studios, Tubbesing Sales Corporation is a Dallas based firm focusing on critical power and cooling equipment and services for data centers, hospitals and other critical sites. 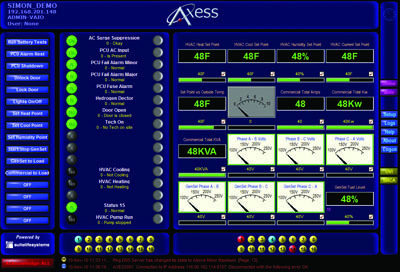 With the APC Experience Center on site, clients can simulate real rack power and heat loads an evaluate the required power and cooling systems.Aaron Casey has been a Consulting Engineer for data centers, hospitals and factories as well as a systems engineer for APC supporting major Data Center clients. He is responsible for the professional service division along with key accounts at TSC. Chris Soltesz, Sony’s camera SSE, Keith Vidger, Business Development Manager and Sony Acount Manager for the area Randy Brigham presented as a modern 3D images for Film and TV. Thanks to Jeff Ballow from Highway Marketing for an informative meeting in May. Bill provided solid information of the EAS/CAP transition, compared and contrasted the theories surrounding the move to CAP and recent announcements from the industry including the elements from the EAS Panel held at the 2011 NAB. 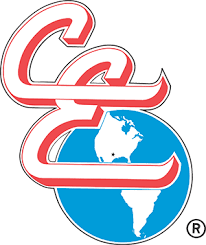 Some links to additional EAS Resources: – The SBE National Website EAS Information section offers FAQ and many EAS links – Texas Association of Broadcasters site has The North Central Texas EAS Plan as well as Complete Texas State EAS Information and The CAP Cookbook is here . SMPTE joined us at Belo Headquarters in Dallas as Mike reviewed how Mobile M/H works, talked about development of ATSC – (M/H) from inception to implementation with a short description of some obstacles and solutions and focused on “how it works” and what you need to know to keep it working. And, Tom Jordan demonstrated the new R&S ATSC (M/H) Analyzer with a live look at some actual signal components received from existing on-air Mobile transmitters. – Click here to go to the Rhode & Schwarz Mobile page. – Belo ’s Tech VP Craig Harper is overseeing the group’s rollout of mobile DTV. Read the article at TV NewsCheck. – The February issue of Broadcast Engineering magazine has a cover story on Optimizing Transmit Antennas for mobile. – At the NAB’s FastRoad Project read the Broadcast Antenna for Handset Report . Researchers are working on tri-band embedded antenna designs capable of servicing mobile DTV and FM radio reception in mobile and handheld devices. On February 24th, we saw new Chapter Officers elected, the latest developments in DTV and HD Radio and a lively discussion of the new C.A.L.M. Act. The meeting highlighted the Nautel line of AM/FM transmission equipment for Radio plus Linear DTV products – including Mobile DTV and SFN and an unadvertised special – David Gerety from Junger-Audio led a discussion about Radio and TV Loudness as defined by the recently signed C.A.L.M. Act and it’s wide reaching implications for all broadcast Radio and TV. Dan presented one of Nautel’s latest developments in HD Radio – Nautel’s Asymmetrical Sideband Modulation system called PowerBoost. Nautel recieved a Radio Magazine NAB 2010 Cool Stuff award for Asymmetrical Sideband technology allowing broadcasters to increase IBOC injection levels by up to 30% without the need to upgrade or replace the transmitter. We also saw AUI (Advanced User Interface) – a GUI-based transmitter control, monitoring and alarming system over IP AND the Wray talked about the VS Series – the latest in low-power FM transmitters featuring an Exciter with a unique Backup Programming solution for a loss of STL situation. Linear TV is a leader in the rapidly growing field of Low Power DTV Transmission with advanced technology for SFN (Single Frequency Networks) , Mobile DTV, Exciters, Encoders, Test & Monitoring, linear and Non-linear error correction, translators and boosters. Our first meeting in 2011 was on January 27th at KERA-TV and KXT-FM. 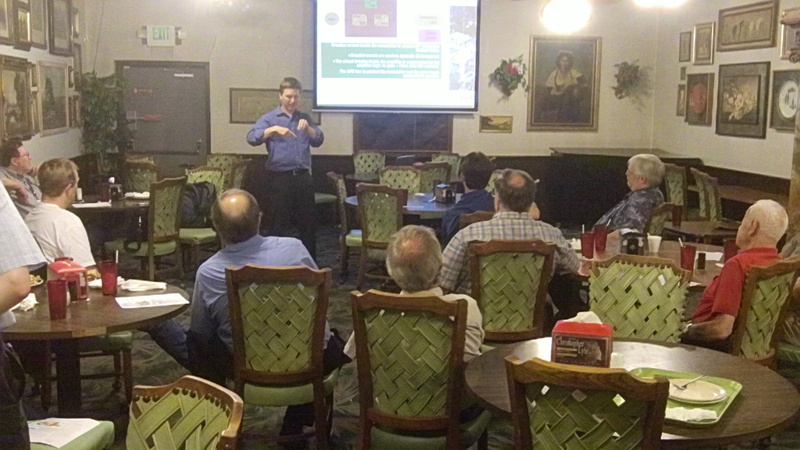 Chuck Walior, VP of Technologies at Aldis Systems, Inc / Broadcast and Media Solutions was our speaker. Chuck introduced us to Aldis and their Systems Integration philosophy and discussed the “when and why” of using and selecting an integrator, maintaining control of a project, budgets, real project costs and support. This year Chuck and his team are finishing some additional work in TV and the group of 38 was treated to a tour of the new SSL TV audio system, MCRs our of and the new KXT-FM Radio Wheatstone Audio installation. Five of the 7 KERA Directors of Engineering from 1975 to 2011 attended the event. 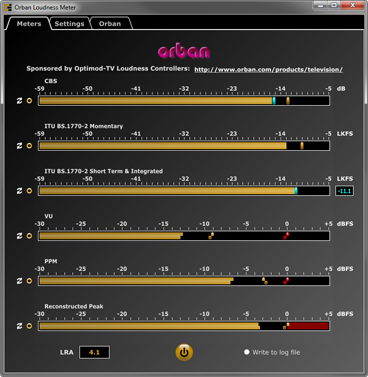 For the December 2010 Meeting – Jay Terleski and Bob Clunn from Array Solutions walked us through a complete demo of both the PowerAim 120 Vector Impedance Analyzer for Broadcast Engineers and the VNA 2180 Vector Network Analyzer on December 2nd. Thanks to John Bisset from Radio World’s long running Workbench column and SBE Educator of the Year for showing us how how IP can improve your life! And as a bonus, a presentation from the Workbench column. Our thanks to Proaudio.com and Tieline for the food and education. Thanks to Morgan Martin from Junger-Audio for an informative presentation on the latest audio rules changes and proceedures to comply. Thanks to Bill Robertson from Digital Alert Systems for a lively discussion of EAS and the new CAPS implementation. Bill covered new rules going into effect this quarter. Thanks to Daniel Loeffler, North American Business Development at MAYAH Communications for an informative presentation audio IP/RTP broadcast basics along with SIP servers and other protocols. At the April 29th 2010 Meeting. The topic was Audio over IP (AoIP) presented by Mike Uhl from Telos Systems and Co-Sponsored by Gary Tibbot of Broadcaster’s General Store.Mike demonstrated the new IP Codecs from Telos, Audio Processing technology for Transmission and Streaming and an AoIP Based Console system. Telos developed the first DSP-based Broadcast Telephone systems and the Zephyr ISDN Codecs. Mike is well known in the area from his time at PR&E in the 70’s. Gary Tibbot joined BGS in 2002 and many of us know him from the early 90’s at Allied. Engineering Director, Leslie Kveton gave us a tour of Citadel Media Network Operations Center. Thanks to Leslie for an interesting, inside Technical look at this major Network Hub. The meeting was well attended and included a side trip with Kent Kramer to Reach Media’s facility next door for many who stayed late. Thanks to Mark Helms and Stephanie Glockzin of ProAudio.com for an interesting history of Crouse-Kimsey and a demo the NewTek TriCaster – a complete TV/Radio field production system that is affordable, portable and small enough to fit into a backpack. It provides all the tools required to simultaneously record, stream, and project programs on the fly. An Ennes Workshop was announced for September 25th at UTA. Presented by Linear Acoustics, we travelled from the first attempts at measuring and controlling Loudness on the radio to the present technology in use in Digital Radio and TV. Our thanks to Kevin King, Regional Sales Manager forNevion USA, who presented Nevion’s ASI Multiplexing, Network Monitoring/Surveillance for ASI/SDI and HD and the VikinX Routing system. Thanks to Craig Vaughn from infraredteam LLC for an infrared boot camp intended to educate and increase our interest in thermal imaging. Thanks to Doug Thompson, representing Linear Industries, Inc. for hosting an educational presentation on cost effective TV transmission solutions and 8VSB measurements. Our thanks to Ann Arnold, President of TAB – Texas State EAS Chair and head of the State Executive Steering Committee for EAS for the latest on new EAS Systems, Procedures and Compliance. She provided some good insight into the efforts by TAB and others to move EAS forward Nationally and in Texas. Thanks to Ellis Terry from Nautel – for a lively discussion of advances in AM and FM Solid State Digital Transmitters designed to help meet the Engineering challenges ahead in HD Radio. This entry was posted in Previously at Chapter 67. Bookmark the permalink.